The failure of the 2004 Olympic basketball team suggests that victory is not guaranteed by throwing together a random assortment of even the most talented individual superstar players. The players must work as a team, if the gold medal is the goal. We believe that the same is true in investing. A diversified portfolio is constructed of holdings with a different pattern of returns that are specifically designed to play better as a unit, as a team. If, in your portfolio, all you do is choose superstars, realize the risk you run. Your superstars too, can fail you. “All-Star teams fail because they rely solely on the individual’s talent. The Soviets win because they take that talent and use it inside a system that’s designed for the betterment of the team.” – Herb Brooks, coach of the 1980 US Olympic Hockey team that beat Russia in what some view as the greatest sports upset of all time. First, let me say I am not a basketball fan. I have probably seen a dozen basketball games in my life. My memory of them is that the games move along fine for a while, but then at the end, all the timeouts and intentional fouls kill the games’ momentum. I could never get into it. So, it is that every spring I am perplexed to find the country gripped by The Bracket Wars of March Madness. If Wikipedia is to be believed, tens of millions of people descend into this madness every year. For all the basketball fans out there, we simply have to count this among the topics upon which we have agreed to disagree. But there are investing lessons even in basketball, dear reader. But I bet that you already guessed I would say that. 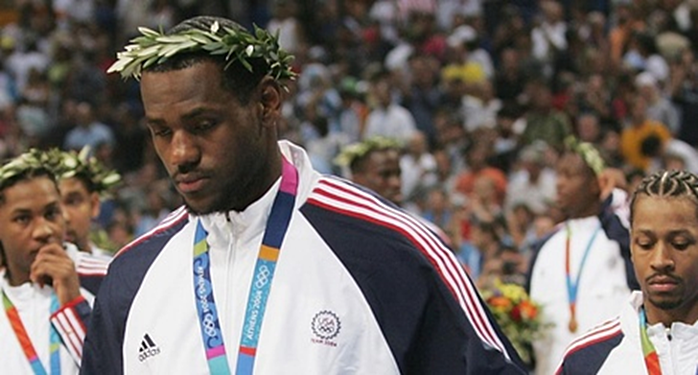 To me, the biggest investing lesson from basketball comes from the spectacular failure of the U.S. 2004 Olympic team. In limping through three losses to “win” the lowly bronze medal, the U.S. team of the best professional players from the best league in the world lost to untested players from Puerto Rico, Lithuania, and Argentina. Ouch. How could this possibly have happened!? On the U.S. team were most of the world’s best players! Superstar Allen Iverson was an eleven-time NBA all-star, league Most Valuable Player, and playoff scorer second only to Michael Jordan. Even a young LeBron James, pictured below, was on this powerhouse team to represent our country as the best of the best in the global competition of the Olympics. Legendary Basketball Hall of Famer Larry Brown was the coach. What could possibly go wrong with such a talented line up of the nation’s most accomplished professionals? In retrospect, everything. This basketball team suffered the worst series of defeats since the U.S. allowed professional athletes to compete in the games. Something went seriously wrong, despite all that assembled talent, as the look on young LeBron’s face so tellingly displays below. Our experience is that many investors construct their portfolios in a similar manner, assembling their own “all-star team” of individual securities they consider to be their best ideas. While understandable, we believe that this process is similarly doomed to failure, because it neglects the importance of how that team works together, as we explain below. We believe a Gold Medal Winning Portfolio Works Together as a Team Through Diversification. It is NOT a Random Collection of Individual “Best Ideas” Thrown Together. In my job as Co-Chief Investment Officer, I see hundreds of inbound investment portfolios each year. Some of these were created by individuals who managed them personally. Others were assembled by “professionals.” All of them represent the collected hard won savings of people who did without to create that money, hoping that it would work just as hard for them, as they did for it. Most of them fell short of that goal. After all, was it not dis-satisfaction with whatever they had been doing before that led them to our door? While there are many things about which I could generalize when it comes to these inbound portfolios that we review, quite possibly the most striking failure is a lack of teamwork within them. Often there appears to be no thought whatsoever to how these “best ideas” will play as a team. This suggests that it’s simply a question most don’t ask. Yet, to us, it’s one of the most important questions that investors should be asking, as we explain below. For instance, we might see a portfolio over-concentrated with an investor’s favorite biotech stocks or latest tech winners. There may very well be some real superstar talent on their team of investments. But, even if the original securities were selected with great care, they simply don’t work well together. Perhaps the portfolio’s owner is a recently retired executive from the manufacturing industry. Such a portfolio may be wisely invested in what its owner understands after long experience so close to that industry. But what about great companies in other industries? And what happens if that industry goes into one of its periodic slumps? Other portfolios may be unknowingly concentrated in early cycle stocks, a failure we find appalling, now that we are ten years into a cycle whose average length is ten years. In our view, a late cycle portfolio should be optimized for downside protection, a far different posture from that of an early cycle portfolio that should be much more aggressively positioned. An inbound portfolio that we may see could also fail to look ahead to the next cycle’s opportunities and be accordingly over-concentrated in the past cycle’s winners. This is an understandable but potentially painful mistake. A surprising number of such stocks may trade at nose-bleed valuations, which is – after all - how they came to be the past cycle’s winners. But a fresh set of eyes has not critically evaluated them for their future merit, which we believe is all that matters, is it not? Accordingly, there sit these legacy holdings, stale and unmanaged – potentially a lurking menace to future returns. It’s been our experience that such neglected positions are often subject to devastating drawdowns, if – shockingly - this cycle does what all prior cycles have done, which is END. One of the most ubiquitous failures we see is investors taking far more risk than they should. They got there in a good way: they were successful! But such investors can find themselves with a mismatch between a wealth accumulation portfolio versus a wealth protection one more suited for their retirement needs. After a lifetime of hard work and long experience accumulating their retirement savings, we find such investors are often wildly overconcentrated in equities and unfamiliar with a broader set of tools to stabilize returns or boost income such as bonds or alternative assets. Don’t get us wrong, we are big fans of investing in your best ideas. However, in our view, you can’t stop there. We believe thoughtfully constructed portfolios that can win the gold are different from those that we describe above. In our view, a winning portfolio is a diversified one. This means that its individual holdings are selected specifically because they have a different pattern of returns. For instance, this could include a mix of early, mid and late cycle investments. Some investments we own specifically because we expect them to do well when others are doing poorly. This is especially appropriate, we believe, as we get deeper into one of the longest cycles in post-War history. We have profiled many such ideas in the past, which include gold related investments, U.S. Treasury bonds, equities that profit from credit distress, and mortgage REITs that profit when the Fed is cutting interest rates. These hedges are selected with the goal in mind of demonstrating their value when investors need it most, when broader markets are weak. Done correctly, this can boost long-term returns and – importantly - limit downside volatility in times of market stress. Less volatile returns raise the odds that investors can see their investment plans through to the multi-year conclusion for which they were designed. More volatile portfolios of individual “super stars” may seem to offer the promise of burning more brightly in a booming bull market – but can fail their owners by subjecting them to unacceptable downside losses. The failure of the 2004 Olympic basketball team shows that victory is not guaranteed by throwing together a random assortment of even the most talented individual superstar players. The players must cooperate as a team, if the gold medal is their goal. We believe that the same is true in investing. If you have never asked yourself how your investments play together as a team, we think it’s time you should.